1.The effect can last up to 10 hours. 2.This patch can help revive mind, relieve headache and drowsiness, dizziness or others fidgety symptoms. 3.By the two-way Penetration with water, the extracts from plants can soon to clearing mind, refresh and relieving high temperature. 4.Mild to skin and without any residues. 6.Have high aquosity & excellent biocompatibility that can avoid being dry and fall off. 3. For those who will dizzy when in a bus, at sea or work in High-temperature environment. 1. Avoid direct contact with the skin around the eyes and mouth and sensitive skin. 2. Discontinue use if rash, redness, itching or irritation occurs, and then adverse symptom will disappear. 4. When used on children adult supervises is required. 5. When the body temperature over 39°C you must seek medical advise. 3. 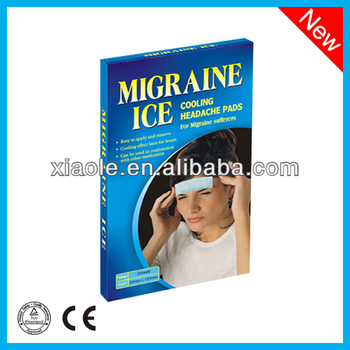 Apply the cooling gel plaster gelatin side directly on the forehead or temples and Dazhui Acupoint on the neck. 4. Several plaster can use together on the common carotid and the femoral arteries so as to bring down a fever more quickly.